I’ve just been admiring this beautiful installation, Molar, created in 2016 by Chinese-American artist Jennifer Wen Ma. Molar is a new site-specific commission created for A Beautiful Disorder, a group exhibition of 16 Chinese sculptors at the Cass Sculpture Foundation. Many of Wen Ma’s works take landscape or nature as their subject matter; this installation offers a place of reflection in a disintegrating utopia, where beauty and destruction cohabit, and inspiration can be drawn from the diseased as well as the prosperous. Watch an interview of Wen Ma in conversation with Studio International talking about Molar and her wider practice, now split between Beijing and New York. The below text has been lifted directly from her website. Ink-painted acrylic glass panels, 480 pieces of hand-crafted glass, flashspun nonwoven HDPE fiber leaves, 75 kg of Chinese ink, lights, wooden walkway, steel framework, sound files, and audio playback system. 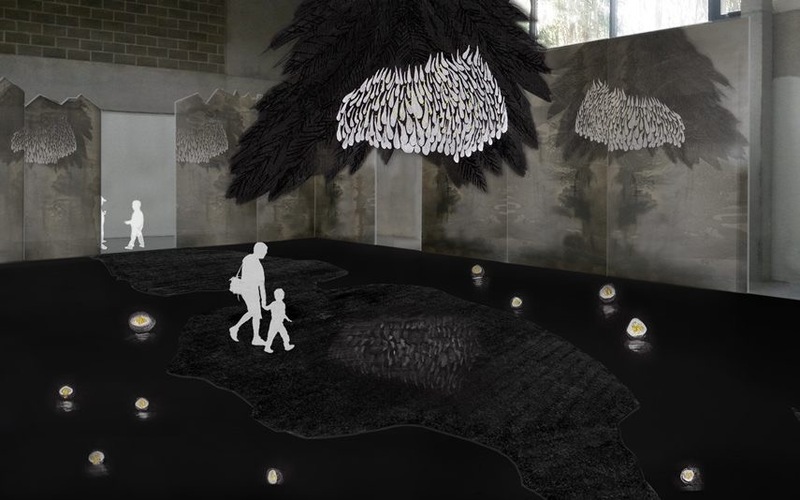 This new installation for the Cass Sculpture Foundation merges mythological, spiritual, and humanistic notions of Paradise, inspired by the surrounding West Sussex English gardens, to create an otherworldly secret landscape within the main gallery. 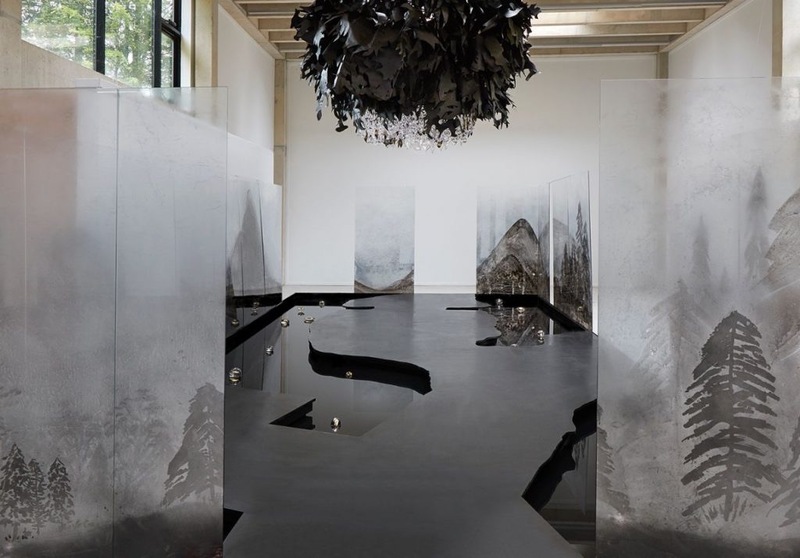 Upon entering the gallery, visitors see tall panels of semi-mirrored glass encasing a blackened gardenscape occupying a large portion of the gallery. 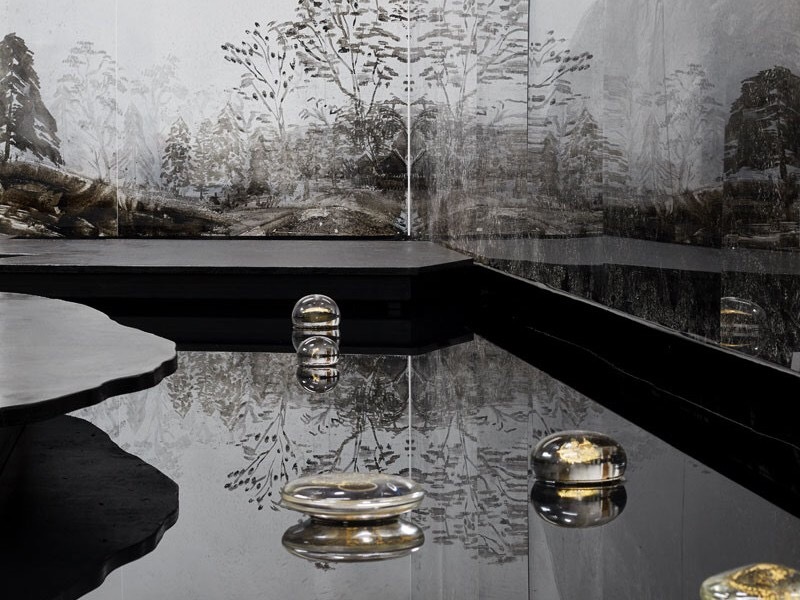 Openings in the glass panels reveal a reflective black landscape path in a pond of black Chinese ink, speckled with illuminated glass spheres. The form of this landscape is based on Chinese garden designs, drawing parallels between gardens of East and West. An enormous upside-down tree made from black paper hangs from the ceiling, nestling a large cluster of illuminated glass in teardrop shape, in quantity of hundreds to form a chandelier that measures approximately three-meters in diameter. These precious gems appear to be the fruit put forth by the sprawling tree. Lights emanating from the glass fruit come from various points within the cluster, bouncing from one glass to another. The cluster contains larger sized pieces in the center, skirted with smaller bits that get variably diminutive at the outermost perimeter. This tree chandelier reflects onto the surface of the pathway, ink pool, and mirrored panels, framed by the 16 glass pieces that float in the ink. The glass orbs are in various sizes with gold-flecked centers and lights emanating from within. The mirrored panels blur the boundaries between the gallery space and the installation, reflecting the installation while also permitting visibility to the space beyond. Viewers are completely immersed within the environment, and are free to walk and explore along the pathway. A simple and sparse music composition echoes within the inkscape through speakers. 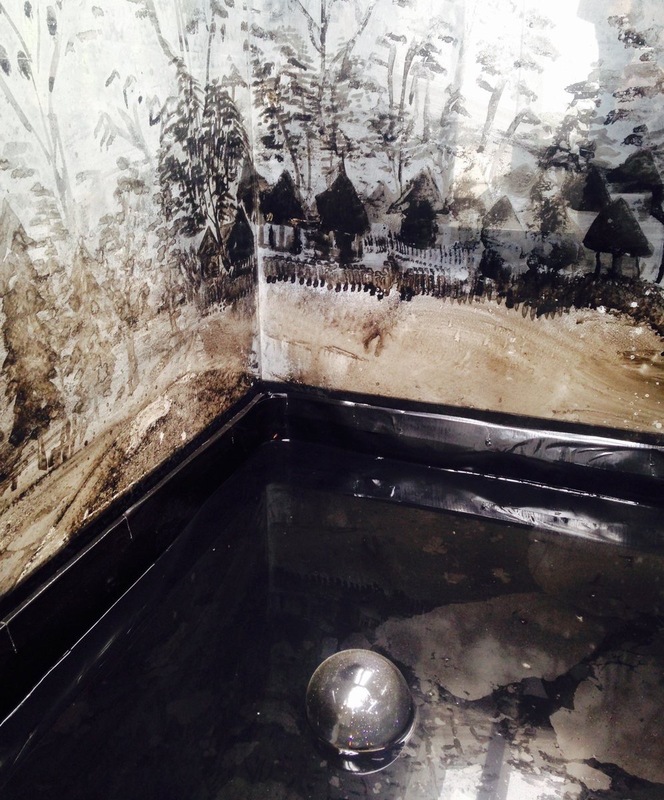 This installation is an extension of my exploration of traditional Chinese ink painting in a contemporary framework. Landscape paintings on scrolls are meant to create a panorama and insert the viewer into the landscape. Chinese landscape paintings synthesize multiple perspectives into a single work, allowing nature to overcome the individual. This idea is interpreted here within a three-dimensional state, as the viewer has an immersive experience within the ink landscape. Mo, Chinese ink, has been the main medium for expression and communication for centuries in East Asia. It embodies all colors, emulates all forms, gives meaning to brush strokes, and aesthetic achievements. Concurrently, black is the culmination of all colors and absent of all light. It is also a powerful symbol of void and muteness. This work also meditates on the idea of paradise in historical and contemporary society as a continuation of my last three years of researching mythical gardens – from Babylon to the Garden of Eden Babylon–which led to the development of installation opera Paradise Interrupted. The word paradise means enclosure or park. Throughout history, humans try to break down the barrier of this utopian idea to get into or out of a paradise. Psychological and emotional paradises must also be grappled with–ideals of how life would be, notions about parents or caregivers, etc. We reconstruct our lives in accordance with new discoveries and persevere. The capsized tree of life hanging in the middle of the landscape is our broken paradise. Despite its state, it is still generously distilling its essence into the gems. The gems that sparkle in the pond and hang from the tree are shaped like commas, tear drops, sperms, embryos, tumors or perfectly shaped spheres. They are the fruits of inspiration that are borne by the blackened tree of life. The semi-reflective panels surround and protect this magic while reflecting the interior and showing us ourselves, thinly veiling what lies steps beyond its walls.